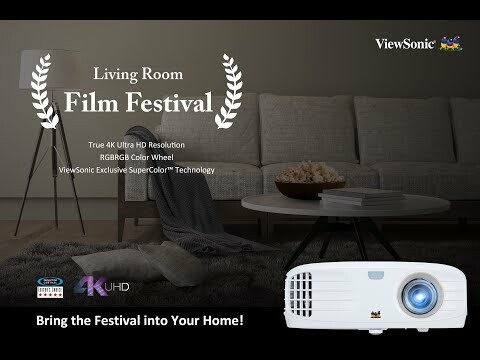 ViewSonic PX727-4K is a 2200 ANSI Lumens 4K Ultra HD projector for living room entertainment. PX727-4K leverages the latest XPR technology to project 8.3 megapixels of true 4K Ultra HD resolution for maximum detail. PX727-4K supports HDR and Rec. 2020 enhanced content, which maximizes detail in the darker and brighter parts of a scene for a viewing experience much closer to what is seen by the human eye. Color on this projector is powered by an RGBRGB color wheel that achieves 96% coverage of the cinematic standard Rec. 709 color space, enabling you to enjoy a cinematic experience in the comfort of your living room. Dual HDMI inputs offer quick connection to an array of devices, while the integrated USB power supply can be used as a power source for connected dongles and devices. Pick your favorite movie, grab some popcorn, and get settled in for a movie night! The PX727-4K home projector gives you the movie theater big screen experience we all love with the same color used in theatres across the world. Whether you’re saving the world, battling giant apes, or flying through space, our 4K Ultra HD projectors make you feel like you’re right in the middle of the action! With 8.3 million pixels being projected onto your screen via Texas Instruments DLP XPR technology, PX727-4K is able to deliver the vivid detail of true 4K Ultra HD with 4X the clarity of Full HD. The specialized high-speed RGBRGB color wheel intensify reds, blues, and greens, while also focusing on hue and saturation enhancement to project images with smooth color gradients. PX727-4K achieves 96% coverage of the Rec. 709 color space for excellent color accuracy and the same jaw-dropping cinematic color you would expect at a movie theater. PX727-4K supports HDR content to produce more realistic looking images and bringing flat images to life with more displayable informatio in the dearker and brighter parts of a scene. This feature re-masters each object individually to produce sharper and more detailed images. TColor enhancement optimizes colors individually to maximize color gradation performance. Prevents discoloration from the projection light and achieves natural-looking skin tones. In addition to HDMI1.4 input, PX727-4K also integrates HDMI2.0 with HDCP 2.2 allowing you to enjoy true 4K Ultra HD content from devices such as streaming boxes and newer 4K UHD Blu-ray players which must be HDCP 2.2 compliant to pass 4K signal to 4K UHD projectors. (must be HDCP 2.2 compliant to pass 4K signal to 4K UHD projectors). A built-in 5V/1.5A USB power output can be used to supply power to HDMI wireless dongles, like Chromecast, Amazon Fire TV Stick, etc. Eliminating the need for separate power adapters when streaming your favorite multimedia content. With 120% offset and vertical keystone, the projector provides flexible installation and auto-corrects the position of projection by shifting the image vertically up to 120% without sacrificing image quality and size. The projector’s lens ensure that projected images are sharp, crisp, and maintain focus through the entirety of your usage by utilizing a pure glass lens for high volume light transmission. A centrally located power button makes for easy control of the projector’s status and also doubles as an infrared receiver for convenient projector management.